Maximum 20 mins of prep time. Few hours of very impatient waiting. And there you have a delectable frozen treat, bursting with alluring aroma and flavor of Mangoes! 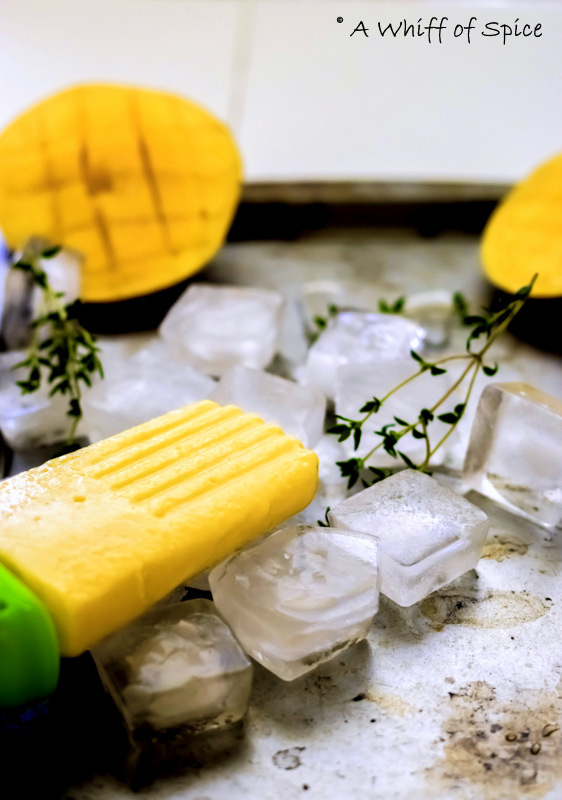 Say Hello to Dreamy Creamy Mango Smoothie Popsicle!!! When it comes to fruits, there is Mango and then there are other fruits! We are a very fruit happy family and there's rarely any fruit that we do not enjoy. But lets be honest, Mangoes does makes our hearts skip an extra beat! And if have grown up in a tropical country like I have, summers are never complete without the sweet "King of Fruit". The Mango is called the King of Fruits, not only for its intoxicating aroma and delicious, sweet taste, but also because of their amazing health benefits. Research has shown antioxidant compounds in mango have been found to protect against colon, breast, leukemia and prostate cancers. One cup of sliced mangoes supplies 25% of the needed daily value of vitamin A, which promotes good eyesight and prevents night blindness and dry eyes. The tartaric acid, malic acid, and a trace of citric acid found in the fruit helps to maintain the alkali reserve of the body. When it comes to diabetic diet, it is generally advised to steer clear of Mangoes. But recent studies suggest that the Mango might be actually help to normalize insulin levels in the blood. The Mango also has a relatively low glycemic index (41-60). So moderate quantities will not spike your sugar levels. To further stabilize any spike that might be caused because of the natural sugars present in the mangoes, I have paired it with protein rich Greek Yogurt. With a pudding-like texture and a slightly tart flavor, Greek Yogurt also has more protein and fewer carbs and fewer sugars than traditional yogurt. It not only bring a creaminess to the popsicle but, host of other nutrients too. Greek Yogurt is packed with probiotics. These are microorganisms such as bacteria and yeast. These normally live in your intestines, and having good microorganisms in your intestines helps keep you healthy. 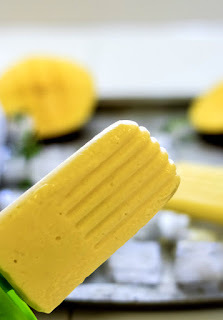 These Dreamy Creamy Mango Smoothie Popsicles are totally diabetic friendly and an awesome afternoon snack or a post dinner treat. I have used naturally sweetened Vanilla Greek Yogurt in this recipe. You can use plain Greek Yogurt and add a splash of vanilla. I usually use No-Fat/Fat-Free Greek Yogurt for my recipes. No-Fat or Low-fat Yogurt will work perfectly if consuming as a smoothie. But if you are freezing it, the popsicle will taste icy instead of creamy. Full Fat Greek Yogurt is necessary for this recipe. The recipe makes more than 3 cups of smoothie. I used 1/2 cup popsicle molds. If using 1/4 cup molds, halve the recipe. Or make the entire batch. 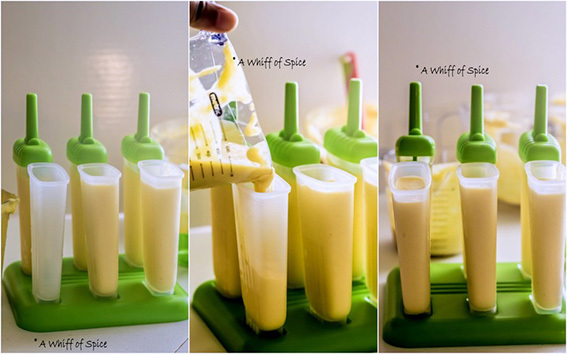 Freeze the half the quantity in popsicle molds. And enjoy the other half as a refreshing and filling post workout smoothie. This Dreamy Creamy Mango Smoothie Popsicle was much loved by both Sam and Sid. I would have preferred a little less sweet. Please adjust the amount of Maple Syrup (or Honey or Agave Nectar) to suite your taste. Enjoy and have a fun filled Summer! 1. In a blender, add the Mangoes, Greek Yogurt and Maple Syrup (or Agave Nectar or Honey). 2. Blend on high. Greek Yogurt is very thick and creamy. A little bit of milk is required to get the Smoothie consistency. Add 1/4 cup of milk and then keep adding in 1 tablespoon increment till you get the desired consistency. If using regular yogurt, skip the milk. 3. Check for sweetness and add more sweetener of choice, if required. 4. 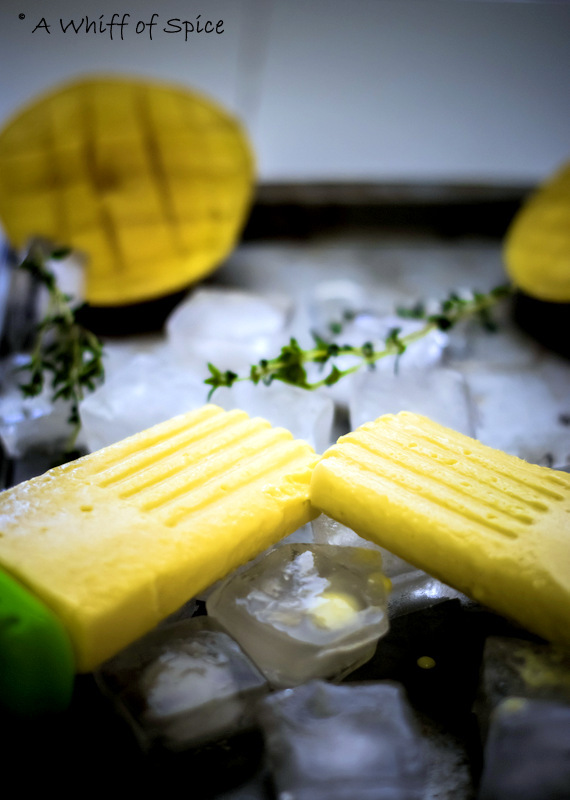 Pour into prepared popsicle molds and freeze for anywhere from 4 hours to overnight. 5. To remove the popsicle from the molds, dip the bottom of the mold in lukewarm water for about 10-15 seconds. Enjoy!!! 1. The recipe makes a little more than 3 cups of smoothie. I used 1/2 cup Popsicle molds. If using 1/4 cup molds, half the recipe. 2. If using plain yogurt add a splash of Vanilla Extract. 3. Agave Nectar or Honey can be substituted for Maple Syrup. 4. I usually love using No-Fat Yogurt for my recipes. No-Fat or Low-fat Yogurt will work perfectly if consuming as a smoothie. But if you are freezing it, the popsicle will taste icy instead of creamy. Full Fat yogurt is critical for this recipe. Mangoes are not called the king of all fruits, just for nothing! They fight cancer, alkalize the body, aid in weight loss, regulate diabetes, help digestion, clean your skin, and make the perfect snack. 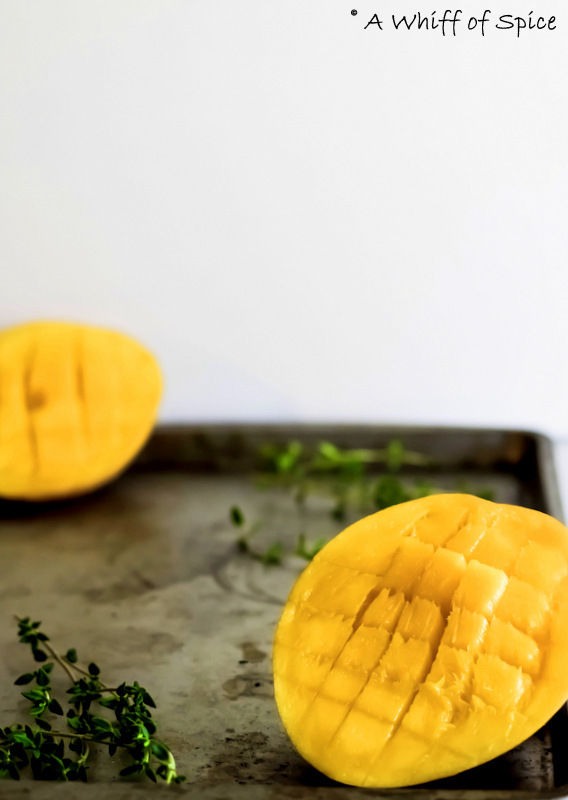 are 17 healthy reasons why you should be eating a mango every day. Read 17 healthy reasons why you should be eating a mango every day here.